Two very nicely wrapped 100g bars of dark chocolate arrived on my doormat – oops, quite some time ago now. Chocolate and Love is an online shop selling high quality chocolates which are ethically sourced from small producers. As well as offering their own bars and those from Amedei and Beschle among others, they also sell more unusual items such as raw chocolate, cocoa nibs and chocolate tea. If you are a chocolate lover, their website is well worth a look. Its always good to see another ethical chocolate product on the market and I was pleased to see that these own label bars were both organic and fair trade. I would have been even more pleased if they were Soil Association certified, but that’s one of my crusades. The cocoa itself comes from small scale farmers in Peru and the Dominican Republic. The wrappers were gorgeous with a cocoa inspired motif. I particularly admired the orange flavoured one which had oranges peeping out amongst the cocoa pods. On the reverse, you can find information about the co-operatives from where the chocolate is sourced. The outer wrapper is FSC certified which is good, but I was rather disappointed to find that the inner wrapper was plastic. Plastic is not what I expect from a good quality product which claims to be ethical, apart from being non-recyclable, it also looks rather cheap. This had a good snap and a pleasant melt in the mouth texture. Orange flavouring in chocolate can easily be overdone. This bar, however, had a very pleasant true orange taste which was not in the least overpowering. It was somewhat like a seville orange, bitter and marmalady – it tasted like real fruit rather than something synthesised in a lab. It’s not designed to be scoffed in large quantities, but savoured slowly – this can only be a good thing. CT, as the chocolate coffee lover in our household, got to try this one, or at least the 20g he was allowed – I had designs on the rest. Again this had a nice snap, a firm texture and was rather crunchy in the mouth as befits a strong, robust flavoured chocolate. CT reckoned this was an Adult X rated product for those who enjoy strong flavours, not to be taken before bedtime. The coffee flavour persists on the palate for quite some time. It was delicious and not overly sweet nor cloying. It’s a wake up call rather than a comfort food and is best taken in small doses. The remaining 80g was used in a coffee chocolate ganache to top the praline cake I recently posted about. As some of you may know, I am more likely to split my ganache than not, but this chocolate worked like a dream and I had no problems at all. Its powerful taste worked particularly well with this cake. Plastic wrappers notwithstanding, I would be very happy to partake of these again and try more of the Chocolate and Love products. These sound interesting. Are they only available online? They both sound right up my street. I love coffee chocolate, so that would be my first choice. Anonymous 1 – I’m only aware of them being available online, but it’s probably best to ask Chocolate and Love themselves. Kath – yes CT was rather taken with the coffee (the little he was allowed anyway). 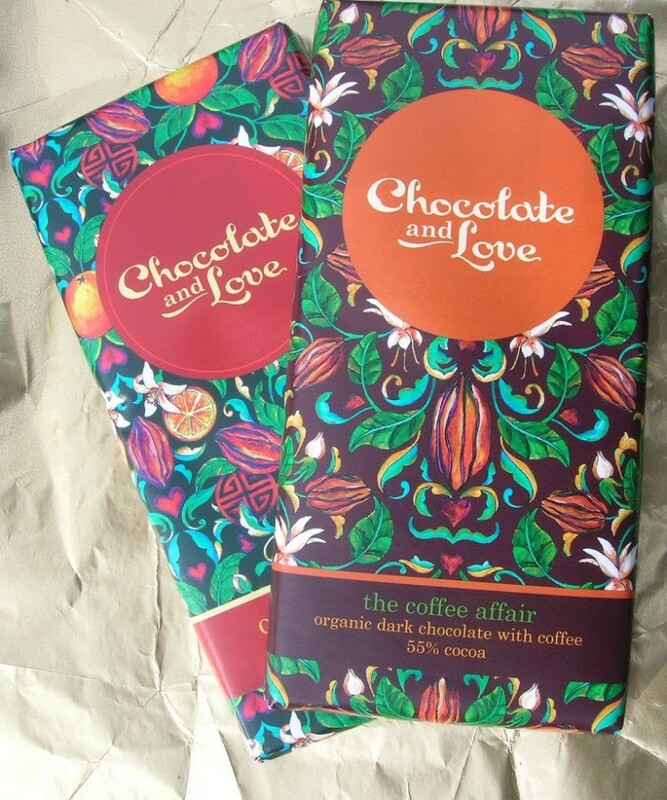 CityHippy – I loved the outer wrappers and the chocolate was pretty good too. I’d like the Coffee Affair! MMMMMM,..thsoe chocolates look so tasty! !